The Yoga of Sacred Song – new date! Ancient tradition and modern experts agree that past traumas and negative cultural conditioning in early life are stored in the fifth chakra (also known as the throat chakra). Often, stuck energy in this area presents as an inability to express oneself comfortably and easily through speech, song, and vocalization. Freeing the voice is an important and enjoyable key to transforming trauma and facilitating the flow of energy through this important center of expression. Gathering in a stunning Topanga location, you are invited to a full-day immersion into joyous sounding, singing, movement, and meditation. We will engage in both fun and contemplative body, mind, and spirit practices intended to create flow, release tension and holding, allowing for greater freedom in this most important chakra. You will emerge with a greater understanding of your personal energetic blocks and practical tools to access and support your voice. Vegetarian/vegan lunch will be fully catered, including morning refreshments and delicious afternoon local, organic juice/smoothies top it all off! Whether you are an advanced singer or have no singing experience at all, this will be an opportunity to root down into your sacred connection with your expressive self. Kimberly Haynes has dedicated her life to healing through sound and music. A survivor of severe childhood trauma, she spent many years lost in a cycle of anxiety, addictions, and self-destructive patterns. Through intense spiritual practice, fierce determination, and a deeply devotional relationship to her craft, Kimberly was able to lift herself out of the ashes. In doing the painstaking work of recovery, release, and finally healing the wounds of her soul, she is a uniquely qualified guide for those seeking reconnection with their true voice, both inner and outer. Her study of sacred song from around the world, along with five years of apprenticeship in sound healing gatherings, has given her vast experience and unique insights into the transformative power of music and singing. 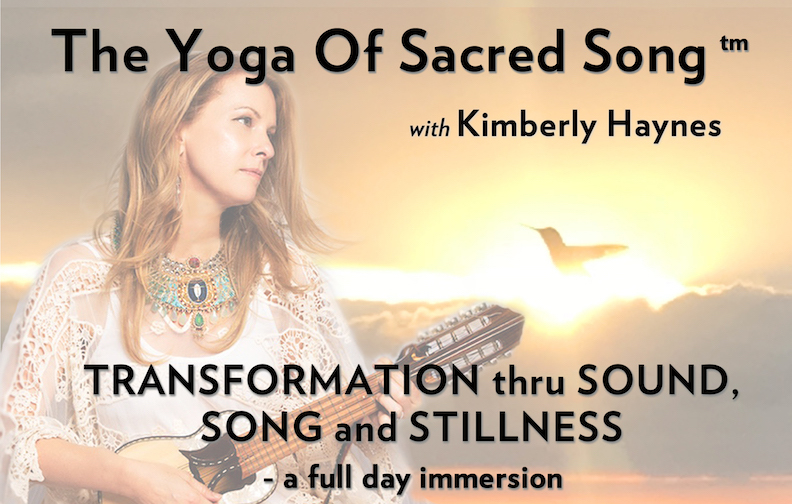 Kimberly has been blessed to bring sacred song intensives and the healing power of devotion to those who, like her, find solace and guidance through music.